Subscribe for campaign updates, advocacy opportunities, and more. The Black-footed Ferret is the only ferret species that is indigenous to North America. Currently, reintroduction programs are in place geared towards re-establishing the population. Lifespan: In the wild these ferrets only live for three years and in captivity they can live five to seven years. Size: Male adult Black-footed Ferret averages 53 cm in length; the female is smaller by about 10%. Population estimate: Not observed in Canada since 1937; across North America in 19 supervised reintroduction sites, there are more than 1,000 ferrets living in the wild. The Black-footed Ferret is the only ferret species that is indigenous to North America. Since 1937, there has not been a Black-footed Ferret observed in the wild and in 1974 it was listed as Extirpated. 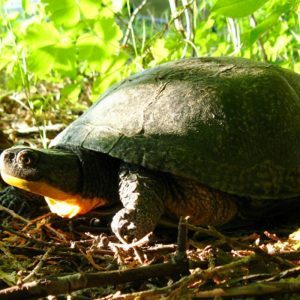 In Canada, reintroduction programs are in place, geared towards re-establishing the population. The first reintroductions into the wild were in October 2009 where 34 ferrets were released into Grasslands National Parks of Canada. This was the first of a series of annual releases. The adult male Black-footed Ferret has an average length of 53 cm and the female is smaller in length. In the wild, ferrets live for two to three years but can survive up to seven years in captivity. It has white fur with brown ends on the back that gives it a buff appearance. The forehead, ears, throat, belly, muzzle and a large section of the tail is white. Its claws are covered by long hairs and there is fur on the bottom of its feet. The Black-footed Ferret is easily identifiable by a dark brown mask on the face and dark brown feet and tail tip. This species lives in short grass prairie and its diet includes mainly Prairie Dogs but also mice, squirrels and ground nesting birds. The habitat of both Black-footed Ferrets and Prairie Dogs interlink: the ferrets live in the burrows of Prairie Dogs where they give birth and raise their young. Historically, Black-footed Ferrets extended from northern Mexico to the southern grasslands of Saskatchewan and Alberta and the survival story of this species shows the importance of having a balanced food web in the wild. As Prairie Dogs were targeted with extermination efforts due to their burrows impeding efforts to convert grasslands to food crops, the Black-footed Ferrets lost almost all of their primary food source and the population began to drop. Although the ferret eats other small mammals, rodents and birds, the Prairie Dog makes up the majority of its diet. This species was listed as Extirpated by 1978 and some thought they were globally extinct until 1981. This was reconfirmed in May 2000 and April 2009. In 1981, a Black-footed Ferret was found in Wyoming and from there, it was discovered that there was a small colony of 129 wild ferrets. However, this number soon dropped due to a disease epidemic and there were only 18 remaining soon after they were found. Researchers took the remaining 18 into captivity where seven of them had reproduced. Today, all the Black-footed Ferrets alive in North America are descendents of those original seven ferrets. A successful conservation breeding program has been providing the black-footed ferret reintroduction in the U.S. and Mexico since 1991. It was intended that the species begun reintroduction to Grasslands National Park in Saskatchewan in 2009. There was a major captive breeding program with one population of approximately 5800 individuals that had been born into captivity. These individuals were held at seven different locations, one of which is the Toronto zoo. In this program, the Black-footed Ferrets get prepared for reintroduction in a ‘boot camp‘ where they learn to hunt, find the appropriate shelter and flee from predators. These so called ‘boot camps’ are in place as they help increase the chance of survival for the ferret. Since 1992, the Toronto zoo has raised 269 kits (young), the majority of which have been reintroduced into the wild in the U.S. and Mexico. The ferrets from this facility will likely be the ones to be reintroduced into the Grasslands National Park. Black-footed Ferret is protected under the federal Species at Risk Act (SARA). The role of SARA is to advance comprehensive support for the species for its recovery and conservation. The species is also protected under the Saskatchewan Wildlife Act, 1998. As well, since 1992, the Toronto Zoo has been involved in a conservation recovery program for the Black-footed Ferret in Canada. To strengthen the effort, the zoo teamed up with Parks Canada, US Fish & Wildlife Service, and the Calgary Zoo; also onboard are private stakeholders and other organizations. As a direct result of the Black-footed Ferret recovery program, hundreds of young ferrets (kits) have been born under the monitored breeding program and when able to survive on their own they are released into the park’s preserve to re-establish a local population . The goal is to re-establish the ferret across North America’s grasslands and Prairie Dog colonies. In 2009, the first batch of Black-footed Ferrets were reintroduced into the wild in Canada and that year marked a significant achievement in the recovery program. Since the introduction of these ferrets into the wild, frequent monitoring takes place to track how to populations are doing in the wild. Learn about Black-footed Ferret and share your knowledge with others to stimulate concern for this endangered mammal. Find out how you can get involved in the next conservation programs and volunteer! Canada’s wilderness is the world’s envy. It’s our duty to keep our true north strong and green. Learn how we use your donations to protect nature and wildlife.